Just baked a loaf today and was hoping to get some constructive feedback or any knowledge I could use moving forward. Personally, I feel like I am having a hard time judging the bulk fermentation stage and really knowing when it is complete. Am I pushing too far, or not far enough. Same goes for the final proof (which was at room temp for this loaf). I know the finger poke test is one method, but have also read it's not 100% reliable. BUT–I'd really say judging that bulk proof is really what I am after right now. 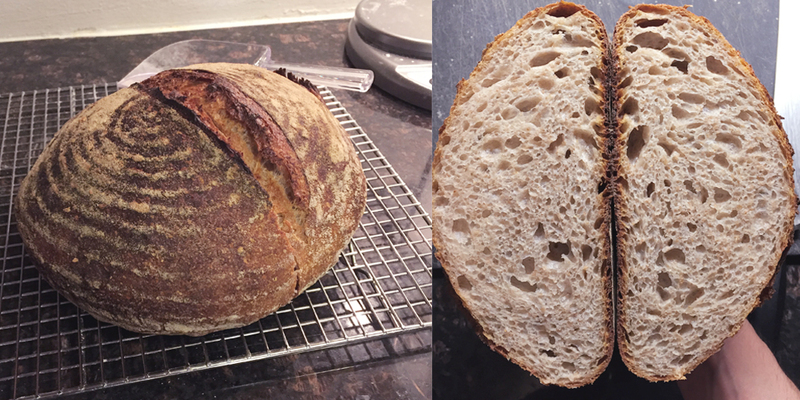 I was hoping for a bit more of an open crumb, and little more oven spring on this one–but the flavor is not bad! If anyone has any ideas or ways to improve please share! I think that is a very nice loaf! But I know what you mean when you want better oven spring and a more open crumb. In my case, I was over fermenting both the bulk and the proof. I cut way back on both, started to use slaps and folds, and I am much happier with my bread. You are going to have to do some experimenting to see what works for you. Looks pretty good to me too! The bottom might be a bit brown but that could be just the photo. It is easy to influence the dough shape with slashing. Try a pinwheel. Practicing on paper. Draw a bunch of circles and slash with a pencil going off center and not completely across. Also try a few patterns with a large uncut center area. HERE are a few ideas. I'll look into some different scoring methods. The bottom definitely could be brown, I usually bake in a dutch oven with no parchment paper. I'm always worried it will catch on fire since the max temp it says on the box is ~425º. Not sure if there is a special kind out there people use when baking at higher temps. Here's another one that I could use some help with as well. Any ideas what could have cause this to happen? I think that the oven spring on this was pretty nice–and got some decent blistering. But one thing I noticed too was that the scoring didn't really explode open as much as others. Could have been that I didn't go deep enough, but not sure. Again, thank you all for your time and comments–it's all very helpful! the bottom (top in banneton) of the loaf? Maybe too deflated pinching of seal or a piled on folding area. It could be that being the most exposed area to the cold fridge temps, it cooled much faster than the dough next to the cane. Was the banneton covered during the fridge proof? I used an envelope fold and then created the tension by dragging the dough back towards me a few times. Yes, the banneton was covered with a plastic bag on the bottom shelf of my fridge during the final proof. Nick, your crumb doesn’t look bad, but I know you are working to improve. You mentioned a number of Stretch and Folds in as many hours. 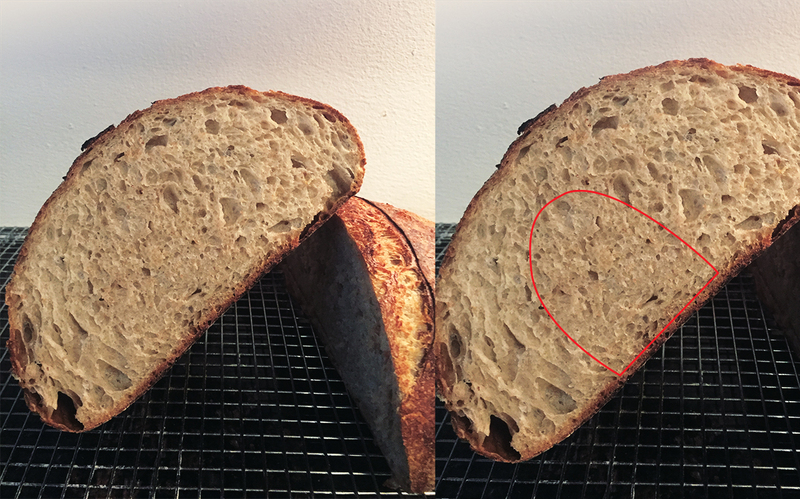 Are to folding towards the end of the Bulk Ferment? If so, you might want to try S&F in the first half only of your BF. This way the alveoli have time to expand undisturbed towards the end of the BF. I've seen a number of methods around S&F, and it's always something I debate myself. I know adding those additional S&F can help strengthen the dough–but at the same time, as you said–can disturb the dough towards the later stages of the bulk. Recently, I have been playing with more S&F as opposed to less, but may consider a longer/stronger mix at the front end to develop the gluten and then fewer S&F. Looking back at my stats for that latest bread I posted, that last fold may have been just before tipping out onto the bench–as Trevor does over at Breadwerx–right before his pre-shape. And as I mentioned in my first post of this thread, judging the completion of the Bulk fermentation stage is really something that's throwing me for a loop right now. Nick, are you referring to how Trevor lightly forms a boule in the bowl before turning out? If so, he does that to make the dough removal easier, but if you watch him, he is not stretching the dough much and is very gentle. Try reducing the time between your S&F so that they aren’t complete half way through the BF. It may not solve your problem, but it’s worth a try. I didn't really catch the mechanics of it and was focused more on the voice over of him saying to give it one last fold. Another thought on that though. 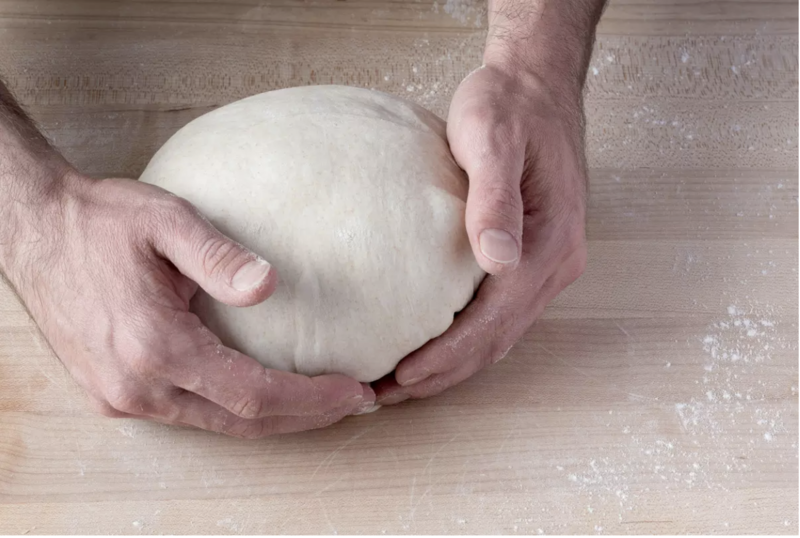 In other instances, I've seen people tip the dough out–then fold on the bench and pre-shape (other times I've seen a tip out onto the bench directly to pre-shaping the boule). Would you say that same principals apply in terms of a light fold when tipping out, folding, then pre-shaping? Yes, if you think about bakers folding the dough during or just before pre-shape, you’ll notice a distinct difference in their handling from when they do S&F during the BF. During the BF the dough is stretched much more. At turn out the dough is lightly lifted and the folded. There is little stretching once the BF terminates. An exception might be an extremely slack dough thta requires additional tension. This may or may not help. But please let us know either way. The first loaf looks fine. I use parchment paper at 520 deg F, no special brand or type. Warnings are printed by manufacturers, in the US at least, to deter lawsuits. Unfortunately. The second loaf looks undercooked to me. Do you have examples of what you want to achieve? Rye and spelt loaves generally look like the first example. They are not too similar to the "San Francisco sourdough" type of bread. I actually gave it a go with some parchment paper and some ciabatta yesterday and didn't have a problem either, so I guess that warning isn't the hard and fast rule. I didn't really think about that second loaf being undercooked, but I suppose that could be an issue. I did get some really nice blistering and pretty deep brown coloring on the outside, so I almost assumed it was good-but certainly something I will keep an eye on. Most of the recipes I have been trying are from theperfectloaf.com (but dropping the hydration for now) and breadwerx.com. The first recipe was actually a very slight variation on a Breadwerx recipe and his crumb (and all the rest of his) seemed a bit more open than mine. (He is clearly much more experienced and better than I am, so I am not surprised by that). I don't think there is a specific type of bread I am after aside from a nice open crumb and good rise, similar to those sites. Knowing that someday I could achieve that wild open San Fran open crumb would be cool. But I'm also just looking to get a good grasp on why certain things are happening with my bread and how I can control it so I can create any type I'd like.